Our school choir worked at the project The Sky is the Limit under the supervision of their music teacher Inga Dóra. Our school choir consists of students from the 3rd to the 6th grade and 25 students are attending weekly to sing together under the guidance of Inga Dóra. They completed the project completely with a little help from Inga Dóra. They were very enthusiastic and set their ambition to do as best they could. They really had fun doing it as you can see on their faces in the video. Nice project, thank you all for making it possible to work at it. 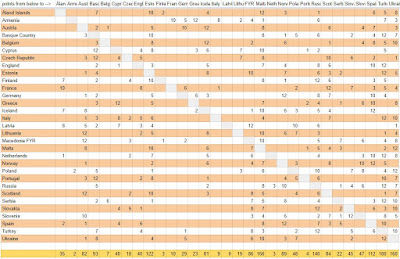 Here is the result and enjoy. Our Polish partner Marek has done the remarkable work to put together this map of all schools that participated in Schoolovision over the past 10 years. Have a look! To celebrate the 10th anniversary of Schoolovision, the biggest eTwinning project of all time, we organised a project week which partners from the Basque Country, Belgium, Germany, Poland, Russia, Slovakia, Turkey and Ukraine attended. All in all we were more than 100 people who made the journey to this special occasion in Krzyżowa, Poland. Among the many activities during this project week we recorded a new version of our project anthem "The Sky is the Limit". Congratulations to our (eT)winners from Turkey! Enjoy once more the winning entry from our Turkish partners! This year, our children have contributed with lovely ideas that we have been able to record in our video. This entry has been focused on the importance of reading and helping people. Children tales are part of our traditions from the moment we are born.We have a project in our school in which older children read to the little ones twice or three times a month and all of them love it. As the song says, we can change the story. That´s the reason why we have changed the personality of some traditional children tales. So the evil characters are now kind. Snow White's stepmother gives apples that poison of joy and the three little pigs are very good builders of houses and buildings. We are really happy to participate again in Schoolovision. All of us have had a lot of fun recording it. Thanks a lot to all the people that have been involved in this beautiful project that every year succeeds in unity and illusion. This year we have chosen to sing a hymn from Åland a bit freely interpreted by us. The lyric describes the nature and the spirit of our island in the summertime. We live in the Åland Islands, a beautiful archipelago situated midway between Sweden and Finland. Åland is an autonomous, demilitarized (no military allowed) and Swedish-speaking region in Finland. Åland has 29 000 inhabitants, and 11 000 of them live in the only town, Mariehamn. Åland has its very own flag. We hope you’ll enjoy watching our video as much as we enjoyed making it! nu blommar sommarns ängar av örter tusenfalt. från fjärdar, berg och skogar det brusar nu till svar. Hör ejderns rop från bådans häll och näktergal i sommarkväll. Här är nu glädjens röster, här är nu glädjens röst. och livets vatten sköljer i ljumma sommarregn. Se svalans flykt i sunnanvind och grönskans ljus i björk och lind. Här är nu glädjens vindar, här är nu glädjens vind. jag vill så gärna vandra din stig längs livets strand. Du räknar alla sandkorn där, för allting lika viktigt är. Här är nu glädjens budskap, här är nu glädjens bud. Armenia - folk song "Ruri"
Dear Schoolovision partners, finally our song is ready. "Ruri" means lullaby. This song is an ancient Armenian folk song, but our school "Folk Band" added some new, modern notes to the song. Hope, you'll like it. With the best wishes from the almost independent Armenia. The 45 final year pupils of Qworzó - Merksplas - Belgium our very proud to present you the Belgian entry for Schoolovision 2018. Since Belgium is world famous for the Tomorrowland-festival, the children wanted to create a Tomorrowland-style song. As all of our pupils love animals very much, they wanted to create a song about 3 unknown animals: the Hoopoe, the Tardigrade and the Indri, so they composed a melody. Later on they got some help from Aaron and Paul on making the music. In our school we think sports and 'movement brain breaks' are important, so we wanted to create a just-dance-video which you can use in your school each time you need a short 'movement brain break'. Just dance along with the dancers in this 360° video; you can look all sides so you get a real impression on how Belgium looks like and our pupils show you their talents. Tip: watch this video on your iPad while spinning around and use your tablet as a window to the real Belgian world. Click the HD button to watch the video in 4K! We want to thank Aaron and Paul for helping us with the music! Hello to all our eTwinning partners! Happy anniversary of Schoolovision! Our 6th grade students sing about first love. They are the authors of the lyrics. The video was shot at the top of a mountain near our city. Best wishes from Western Serbia. Our song is called “To kokoraki”(=“The little rooster”) and it is a well-known children’s song in Cyprus. We prepared this video during a field trip at a zoo in Cyprus and in our school yard. It is about domestic animals and the sound each of them makes (highlighted below). Are the animal sounds the same in your country? Let’s enjoy our 10th anniversary of Schoolovision with this happy song! At the end of Primary School, our students are ready for their journey through life. This song is about that journey. It's a song from our traditional end-of-year musical production. Almost every Dutch primary school performs a musical starring their eighth graders. As before, everything was done by the students themselves. Choreography, editing, even translating the song for the subtitles! The lyrics were brainstormed by two classes of our school. Pianist Ján Lauko from our local art school then wrote the music. Not so easy to sing! However, I believe that he and the sound master got the best from our kids. The song is about the trainers, which got angry because they had different colour shoe laces. They look at each other with envy and both want to run different way. The singers think it is really silly. You live only once so what for is the quarrel? Don't spoil your day and show your real face! Good luck to all Schoolovisioners! Guess what my riddle is? If it is so mighty, an ANGEL? If it is so hot, the SUN? A COMB full of honey? fades in the autumn and smells fragrantly? An ANGEL? It is NOT! The SUN? It is NOT! A FLOWER? It is NOT! If NOT, what is your riddle? Sure! It has no wings, it doesn't fly. It's warm like the sun, but it doesn't burn. It's like a flower, but it doesn't fade. As a kid you can often feel different, and we want to say that it is okay to be different. People can be a little restrict to the people who are different. But here with us, you can feel free and be who you are. The song title Jotne is more of a creature from Norse mythology and a troll. 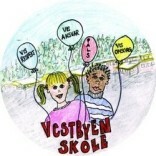 First 7.grade on Vestbyen School got to hear the background music, made by our assistant principle, Olav Hegge Selnes. The background music didn’t have any real melody or text. After we got to hear the background music we had a brainstorming and said what the song got us to think or feel like. Then we all gave a wote to what we wanted the song to be about. What the song was going to be about was trolls. When the theme for the song was in place, we got divided into three groups. The groups were a melody group, text group and a media group. The text group made up the text and gave it to the melody group who made the melody and small changes on the text so the text could fit into the melody. When the song was half made we got visit, it was a musician from Namsos, Norway named Chand Torsvik. He helped us to make what we had made better and gave inspiration and learned us more. When the song was finished, we had an audition to figure out who was going to sing solo on the verses. The singer met with another musician from Namsos, Petter Fjerdingen. He gave them feedback on the melody, and together they made the final version. We recorded the song at Rock City studio. The media group got together and worked on the theme of the song. They made plans for what kind of footage they wanted, and how they wanted the movie to look like. The media group took a film of the solo singers in studio. The day after the other from the class walked in groups down to the studio and recorded the chorus. The media group finished their video, and got help from Olav Selnes to edit the movie, he has also worked as our school project manager. This has been quite a journey, and we have really enjoied being a part of this arrangement. Love from all of us in 7th Grade at Vestbyen school, Norway. Who are you, what do you want, where are you drifting? All judgements, we wonder, what are you? Now you lost everything, you had and are. He held your, little hand, comforting you. You played, in the sand, before you had to leave. You heard it; you heard the gunshots went off. No one like, no one like you, but you, but you, you are perfect as you are! First of all, we all wish a Happy 10th Birthday to this wonderful contest ! This year, we chose the Bubble Gum song. It's a cannon singing, witch is really hard for 6 to 8 year old pupils. They worked very hard to do it and we're very proud of the result. The song is about kids chewing bubble gum at school, witch is totally forbidden ! For the first and the last time of their life, they were allowed to chew bubble gum in the classroom, and they discovered how hard it is to make bubbles !! At last ... but not least... we proudly present our song for Schoolovision 2018 to you. It is called: Lianohortaroudia.... a difficult Greek word to say... that means 'The fields'. The song is a remix by a Greek band that is called Koza Mostra. with their rock rhythm and lyrics. the new generation that traditional music can make you rock too!!! Here the Italian entry for this special edition. Our contribution comes from the Zecchino d'Oro which is an international children's song festival that has taken place every year since 1959. From 1976 the festival took on an international perspective, each year seven Italian songs and seven foreign songs are sung by children and voted for by a children's jury. It is considered part of the Italian cultural heritage This value is evidenced by the attribution, in April 2008, of the plaque of "Patrimony for a culture of peace", delivered during a ceremony organized by the UNESCO Clubs and Centers. My students have chosen one of the foreign song from the 2006 Edition, the song was written by a Turkish composer, they love the message of this song full of hope for the future. Good luck to everyone. And this world, what a world it will be! Our song is called “This litlle heart”, it was written by Dame Kolarovski, arrangement of Dejan Milenkovski, and the little heart with an angel voice is Angela Petrusevska. Iceland - "Is it true?" Our contribution was chosen in Flatóvision which is a celebration similar to Eurovision held in the school in March. Ari Ólafsson, who is going to sing the Eurovision song for Iceland in May, came to our school to help us to find the contribution for Schoolovision 2018. The song is an old Eurovision song from 2009 that wound up in the 2nd place. The students who sing the song now are 9 years old and have lived some part of their life abroad and speak English very well. Clips in the video are taken in the school in arts and crafts lessons such as music, household, textile, construction and drawing. We also took some scenes out in the lava field that surrounds the school yard. Hope you enjoy? Lyrics and music written by Oxana Senkiv, a Canadian composer of Ukrainian origin from Montreal diaspora who wrote it as a special gift for our kids and Schoolovision 2018. She is my angel and goddess. We strongly believe that our mothers are our guardian angels who protect us, help us, love us. Since times immemorial mother has always played an important role in the life of every Ukrainian child giving her wisdom and strength to the next generations. Please take me under your wings! Forgive me my innocent sins. In this song we are promoting peace, understanding, love, beauty of our land in spring and emotional mother-daughter relationships, the strongest of all parent-child bonds. The participants are wearing traditional ancient Ukrainian outfit, typical for the central part of Ukraine. You want me to be strong and caring. And always be helpful and friendly! Please, do enjoy our entry! Good luck to all the Schoolovisionals!!! This year Lithuania celebrates a centennial of restored Lithuania. Our song is dedicated for this aniversary and weaved from Lithuanian folk songs. Happy songs! Let's celebrate! Hello to all our lovely eTwinning Schoolovision friends in this wonderful 10th Anniversary year! England's song this year was originally sung in the 1940s but was made popular in the UK in the 1970s by a band called "The Specials" who came from Coventry, a city just 40 minutes away from Leicester! The band played 2 Tone and Ska music and were formed with a strong anti-racist focus. We celebrate cultural diversity in our school and city every day and continue the tradition of promoting peace and harmony and living well together. Hello we're Mayflower Primary School and we're going to enjoy ourselves first. This is the Schoolovision song from a new team from the Czech Republic. Our song is called “Three pigs”, it was written by J.Nohavica a Czech singer. It is about three small animals, which set off into the world without fear and with courage and they are singing cheerfully a they want to have a good time and get to know the world. We think the joy is the key for happiness. In the video you can see our small town and the places where we have a nice time together. You can find the English words of the song here. Our entry for Schoolovision's anniversary edition plays with languages - also made up ones, and talks about making friends with people from around the world. dann holt‘ ich mir Freunde von überall her. und einen vom Ganges, das wär‘ nicht zu viel. Aus Hütten und Häusern, aus Zelt und Iglu. Die Buben, die Mädchen, die nähm‘ ich dazu. die Straße hinunter und laden dich ein. then I would bring friends from everywhere. and one from the Ganges, that wouldn’t be too much. From huts and houses, from tent and igloo. The boys, the girls, I’d take them along. jump down the street and invite you, too. We say HELLO and GOOD LUCK to all our „Schoolovision-Friends“! At this very special occation of Schoolovision 2018 let us reflect the last nine years of this wonderful eTwinning project. We are glad to be a part of it! For this reason we composed this song including details of the past contributions. It´s a little bit of a sentimental journey. Have fun watching our video – maybe some of you can remember our previous songs? Our song takes us round our island's heritage and rich history during an important year when Valletta, our capital, is designated as the European Capital of Culture. Malta is celebrating cultural diversity as it got great influences from other nations who invaded and ruled Malta throughout history. This can be seen in many of our magnificent buildings, traditions and language. As the number of migrants is increasing, we are somehow living a part of our past history once again. I really hope you will enjoy our song as you travel with our children from place to place. A glimpseatUs from videos on Vimeo. The song from Slovenia is made by ourselves. We have decided to sing about our school life. The lyrics speaks about pride, heartbeat, curiosity, knowledge of students from our school. and behind them heads as many as the sea. at our school in the center of Domžale. hope and desires to be successful. learning, creating, winning gold competing. we take it high all the way to the sky. The song was written by our teacher Darja Hristovski Kandušer and composed by me (Katja Erban). Our students love this song and we hope it will become our school anthem. It was hard to find the time for rehersing the voice and instrumental part, for recording and filming a video. We made it. Now we are so proud of the end result. Who would have thought, way back in early 2009, that we'd be here in 2018 for the 10th edition of what has become eTwinning's most famous, longest running and most prize-winning project of all? As the project founder, I am as proud now of the project as when it began 10 years ago. Probably even more so, as the standard of entries keeps improving each year! For 2018, Scotland are performing the song "Build Up", a feel-good tune that encourages all of us to be kind and loving to each other. In today's world, what can be more important than that? Thanks go to Fischy Music for allowing us to use one of their songs for the second year running! Best wishes to all participants, pupils and teachers, and good luck as we celebrate 10 fantastic years of Schoolovision! 2018 is the European Year of Cultural Heritage, so we decided to celebrate and preserve our cultural heritage with our famous Arraiolos Rug. As we all know, cultural heritage shapes our identities and everyday life, so it is important to preserve it and pass it on to future generations. Arraiolos Rug is a candidate for UNESCO's List of Intangible Cultural Heritage. Happy 10th Anniversary to all Schoolovisioners! This has been the worst winter ever here. It's been rainning, non-stop, for 6 months. And this is what our song is about "Dancing in the rain". While watching the video you can enjoy with the views of our city, Bilbao. You are welcome to visit it! We hope you enjoy with the song and the video. Good luck to everyone!! I'm alive and I feel that way. I'm going all out; today nobody will stop me. because I feel like it, today. I start to dance, ie! Dancing in the street It's raining, ah, ah, ah! It's raining, ah, ah, ah! I'm jumping in the puddles. I feel free completely soaked. as well as in Gasteiz fall the same way. In the street... Dancing in the rain, dancing in the rain! In the street! Dancing in the rain, dancing in the rain! What else to be happy? but these moments are great. Dancing in the rain in the street! Dancing in the rain, dancing in the rain In the street! Here is the video from Finland! It's starting to get warm even here in the north now, but our video still celebrates the beaufitul winter we had! The story tells about sister and brother who like to spend all their time indoors playing with the computer. Their mother tries to tell them to go out instead. Finally the children decide to get dressed warmly and to out. And there they are, their friends having a good time playing in the snow. It's a beautiful winter day! Much better choise to spend your time! We hope you will like our video! The lyrics are by third and fourth graders, who also sang the song. The music was composed by our music teacher and the band members were from highschool. The video was edited by two 8-graders. A true example of co-operation in our school, where grades are from 0 to 9. This is our song about Latvian alphabet. It is funny alphabet. Schoolovision 2018 Latvia from Pāles pamatskola on Vimeo. If you like you can listen and learn version of this song in English (2017). The singer Renārs Kaupers is very famous musician in Latvia. Are you ... one of the children that still believe in magic? Are you ... one of the children with superpowers like love, peace, friendship, understanding and care? Are you ... one of the curious children? R U 1 of us? The Tatar part includes a reference of two mystical folkloristic figures, Su-anasui and Shurale. The children sing that they are not afraid of anything, not even those two. We hope you have as much fun watching and listening as we had putting this together. This schoolyear we got a new building for our youngest students. We were all involved designing and dreaming our school. And now we have it - Kotzebue building. The song is about finding your own island. Our new school is an home island for us. Many thanks to Kait Tamra who allowed to use his beautiful song. A song of the famous Polish rock band T.Love. Lyrics - Muniek Staszczyk, music - Maciej Majchrzak. We had three weeks left when this counter was started. Are you ready to upload your anniversary entry? Go for it! The 2017 edition of Schoolovision was won by our Spanish partners. Congratulations to them once again! Until the new songs for the 10th anniversary edition of Schoolovision 2018 appear here, you can enjoy their inspiring performance and also browse all our previous annual websites with several hundreds of videos from all across Europe and beyond. 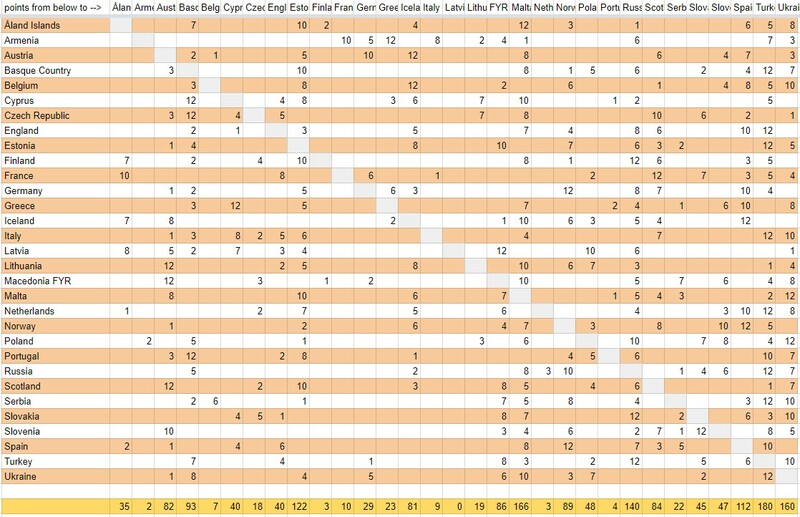 Just select one of the previous editions at the top of the right column. Enjoy! 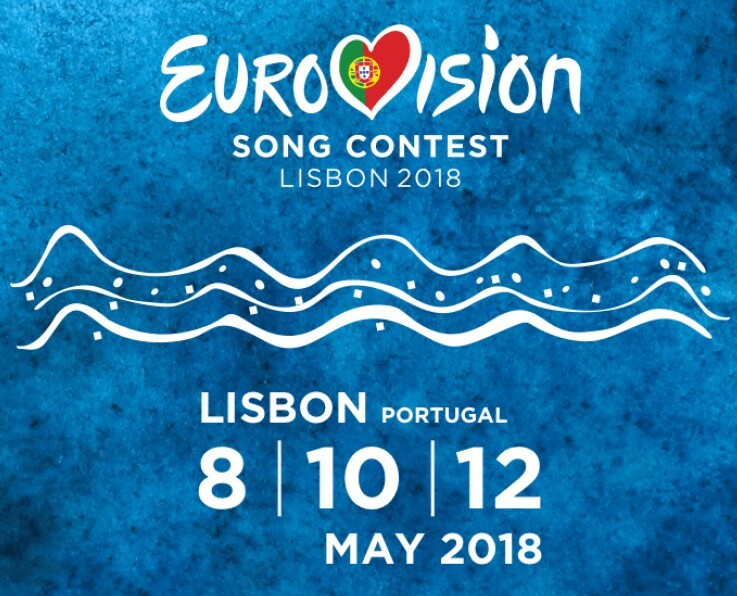 The 2018 Eurovision Song Contest final will take place in Lisbon, Portugal on Saturday, 12 May. 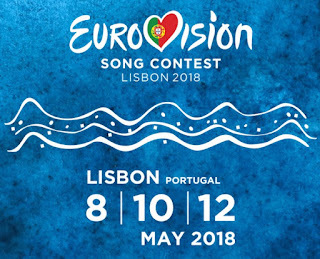 Meanwhile, the 2018 edition of Schoolovision will come to its conclusion on Friday, 11 May, the day before the real Eurovision. Join us in this fun-filled project, as we find out who will be the latest Schoolovision Champions in the 10th anniversary edition of our grand project. In this very special year of the Schoolovision journey we welcome all members, new and old, to this unique eTwinning project, which guarantees fun for all participants, students and teachers alike, as we learn about each others' cultures through the medium of music and song with the added excitement of a friendly competition. Full rules below; please read them carefully! Following a similar format to the Eurovision Song Contest, Schoolovision 2018 will once again allow one primary school from each eTwinning (Plus) country wishing to participate, to record and upload a song of their choice, to be viewed by all other participants in the project. You and your class will have until Friday, 4 May to decide upon your song, practise it, video it, and get it uploaded and embedded onto the project blog website, using either YouTube or Vimeo. Once all songs are uploaded, you will need to get your class to watch all the other countries' entries and decide who will receive your votes. This should be done in the week from Monday, 7 May until Thursday, 10 May. On Friday, 11 May 2018 you have two choices: You can either join the team for a video conference, starting at 10.00 am CEST time, during which we will announce our votes to each other and total the votes up, so we can establish the winner. Or, if this is not possible, you will be able to watch a recording of the video conference afterwards to see who the winners are, or simply visit the project website, as the results will be posted straight after the video conference finishes. In any case, you will need to email your votes to Steffen, the project administrator, by Thursday evening (10 May) and NO LATER than 1800 hrs CEST. Thus we will be able to successfully total all the votes from all participating countries and announce who are Schoolovision champions for 2018. The winning school will be sent a specially commissioned trophy! 3. All previous entrants will already have received a request, asking you to confirm that you wish to enter the 2018 contest. After your confimation you will receive an invitation (via eTwinning) to become an official partner in the project, followed later by a separate invitation to contribute to the project blog. You need to sign up for the blog, whereby you will be able to upload your finished song in due course. In addition, please send Steffen a photograph of your school and the link to its website, so that everyone can see which countries and schools are participating this time. 4. The song you choose to sing should be one of your choice, hopefully chosen in collaboration with your pupils, and can be sung in any language. It can be a well-known song, or an original song that perhaps no-one else will have heard of- it's up to you! However, it MUST be connected to your country in some way. PLEASE BE AWARE THAT IF THE SONG HAS BEEN COPYRIGHTED, YOU MUST GET PERMISSION BEFORE USING IT. 6. All entries MUST be completed and uploaded by Friday, 4 May at the latest. When your song is ready, it is your task to post the video of your song to the project website via www.blogger.com using the embed code provided by either YouTube or Vimeo. All files must be uploaded by Friday, 4 May, as each country will then need to watch all the entries and judge them during the following week, Monday, 7 May till Thursday, 10 May. 7. Once you and your pupils have watched each entry and chosen your favourites, please email your choices to Steffen before 1800 hrs CET on THURSDAY, 10 MAY. 7.a As of 2018 we are adopting the latest ESC rule according to which 50 % of the votes are given by an expert jury, in this case us teachers. As we are not technically able to copy the exact voting process of the ESC, we will install it in such a way that all partners will mix their national pupil votes with their own teacher votes before sending them in. This new process will also render the teacher votings we performed in previous years unnecessary. 8. It is always a great experience to receive positive and encouranging comments. By participating in this project, you also agree to encourage your pupils to write such comments under the videos of their partners. Equally, you will reserve some time to write a number of comments yourselves. You are welcome to encourage colleagues and parents to follow your example, thus making the great work of your pupils and yourselves more known and positively regarded, just as the whole Schoolovision project. In 2018 year we are celebrating the 10th anniversary of our fun-filled partnership in the biggest and long-standing eTwinning project of all time. Browse the list below to see which school represents your country in this very special anniversary edition.